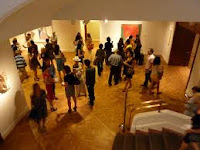 As I wandered around The Phillips Collection‘s monthly evening “party”, it struck me, as it so often does at these things, that the formula is getting tired. The milling around, the live band / DJ, the cash bar, the weeknight social hours, the food trucks…all draw hordes of people in. Last night’s event was sold out. But at the end of the day, very little sets these museum shindigs apart from each other except the art. And therein lies the problem. 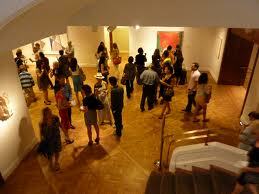 The events should be a way to draw in new people and get them hooked on the collections and special exhibitions. The Phillips Collection is extraordinary in this regard. Few small museums offer such a wealth of masters. Everywhere I looked, the walls were plastered with iconic Monets, Braques, Modiglianis, Calders and Degases. But I walked around observing people, as I do when I go to similar events at the various museums in the Bay Area, New York, London, Chicago and elsewhere, I noticed that barely anyone was actually looking at the art. There’s nothing wrong with museums being social spaces, of course. It’s just that people can socialize in any bar or club. It’s not everywhere that you can engage with artistic endeavor of the highest caliber. That’s what museums and galleries are for. At some point in the not too distant future, I expect visitors will start to get a bit bored with the evening hours “party” formula that’s become part and parcel of nearly every urban art museum’s offerings for the past ten years or so in the States and Europe. Events like Phillips at 5 may cease to be sold out. That might not be a bad thing. At least it’ll force the museums to become more creative about how to get people to actually engage with the art. As a museum director and long-time attendee to various kinds of museum events, I completely agree with you. I think there’s a HUGE missed opportunity at these types of evening events to really engage people with the work. I’m not sure if there’s a terrific late night museum event in DC, but I can promise you that around the country, museum professionals are thinking seriously about this issue. Thanks Nina for your comments. I’ll try to make it to Santa Cruz at some point when I’m back on the west coast and pay your event a visit!